Chatsworth Products, Inc. (CPI) Seismic Protection Systems reduce the risk of equipment damage by stiffening, bracing and stabilizing racks and rack-mounted equipment to comply structural recommendations. When planning installations in seismically active regions, CPI helps reduce the approval cycle by obtaining Office of Statewide Health Planning and Development (OSHPD) Pre-Approval (OPA) numbers for several IT infrastructure products. In compliance with earthquake design criteria, CPI’s Seismic Systems protect equipment so it remains operational when subject to earthquakes. Adjustable bracket for bracing an equipment rack or auxiliary frame to wall or ceiling to meet earthquake safety codes. *Note: Additional installation hardware is required. The Rack Seismic Gusset and Hardware Kit can be added to any CPI Universal Rack (46XXX series) to stiffen critical load bearing joints, reducing the need to stabilize the top of the rack. Secure equipment racks and cabinets to the floor. 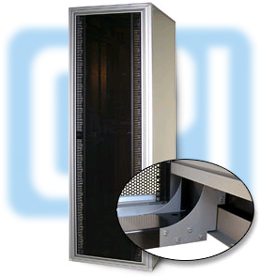 Used to support equippment racks installed on access floor systems. Kits include pre-cut threaded rod, brackets and hardware. Secures equipment from being moved or bumped by seismic activity. *X=color, 1=Gray, 2=White, 3=Clear, 7=Black. Rated Zone 4 compliant, designed to withstand the seismic stress of an 8.3 Richter scale earthquake. *X=color, 1=Gray, 2=White, 3=Clear, 7=Black. Other shelves available. Secure the top of the cabinet to a wall. Stiffening brackets for threaded rod supports. Secures the end of cable runway to the wall. *X=color, 0=Gold, 2=White, 7=Black. Widths ranging from 4” to 24” available.